Памер гэтага PNG-прагляду для SVG-файла: 800 × 533 пікселяў. Іншыя разрозненні: 320 × 213 пікселяў | 640 × 427 пікселяў | 1 024 × 683 пікселяў | 1 280 × 853 пікселяў | 900 × 600 пікселяў. актуальн. 12:09, 29 студзеня 2019 900 × 600 (74 KB) Jdx Reverted to version as of 21:27, 28 January 2019 (UTC): As per request on my talk page. 08:26, 29 студзеня 2019 900 × 600 (54 KB) Tio dari Reverted to version as of 04:59, 29 January 2019 (UTC) - Sorry. I know that the colors are changed but... 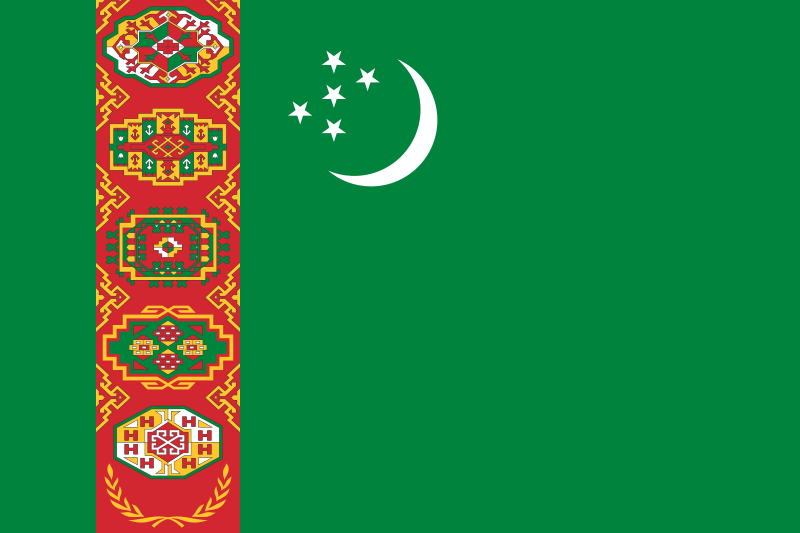 I reverted to this version 'cause the files: "File:Flag of the President of Turkmenistan.svg" and " File:Flag of the Turkmen Ground Forces.svg" doesn't have the RIGHT Green Color. 18:53, 28 студзеня 2019 900 × 600 (54 KB) Tio dari Reverted to version as of 01:39, 26 January 2019 (UTC) - The colors isn't the same with the file: "File:Emblem of Turkmenistan.svg".